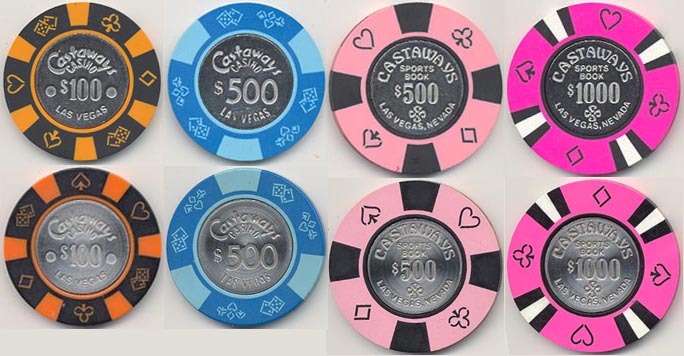 In 1989, Carl Osborne, then a casino executive at the El Cortez, had mounting debts from an on-going legal action, so he had the idea to approach Bud Jones to make counterfeit coin inlay chips for him to sell to collectors. His instructions were that the chips should be, as far as possible, exact replicas of the originals. Bud Jones complied to the best of their ability. Carl stated he ordered up to 'a case' of each chip, which we believe to be 2,000 pieces. Later, Paul-Son made hat & cane chips for Osborne also, although some of the original chips that were copied were in fact CJ's. 18 different coin inlays were counterfeited, followed by 9 hat & cane chips. Apparently, Osborne sold the entire order of Holiday International and Silver Bird chips to one person. He then offered all the other chips to dealers with tables at Jim Munding's 1st Bellflower show in 1989. He openly stated they were counterfeit. The dealers then advertised and sold them to their customers as genuine chips and still do to some extent today. Many may not actually know they are counterfeit nor be able to tell the difference. During the time the legal case against Osborne was building, around 1993, he sold the remaining stock of these chips to Jerry Wall to raise money. They were sold in Borland's old store along with the remaining fantasy and counterfeit hot-stamp chips. Jerry Walls had been a part owner of Bill Borland's 'Gamblers Book Store' and bought the remaining share of the store from the late Borlands' estate. Until the store closed, these chips continued to be on sale there. When Jerry got sick and the store closed, the owner of Gamblers General and a partner bought him out and brought Bill Akeman into their store to catalog and sell them. Mike Spinetti saw them and bought the entire stock. Some years ago, Osborne confirmed he had 25 of the chips detailed in this article made for him and this has also been confirmed by an undisclosed BJ source. Two further hat & cane chips listed below have also been subsequently identified as counterfeits made for him. These have also been independently confirmed. One more chip is still being investigated. These are annotated accordingly. It is possible that Osborne also had something to do with the Foxy's Firehouse chips discussed at the bottom of this page but they were not offered for sale at the same time. Each chip or group of counterfeit chips is annotated accordingly, and where appropriate, details of the genuine counterparts are given also. Genuine chips are shown in the tables with alpha suffixes e.g. '1a' and are highlighted in red. Where I state my scans as being of the counterfeits, I do so by virtue of the fact I was able to trace the movement of these chips. 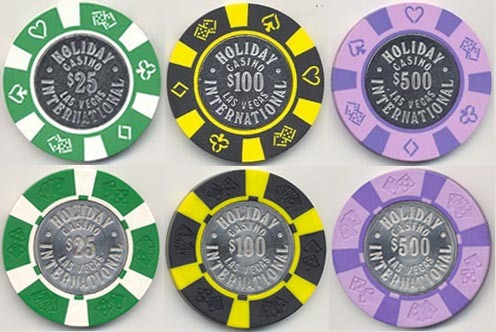 Holiday International and Silver Bird chips - it has been suggested that these were originally made for Bill Borland to sell in key-chains etc. and that when BJ found out Borland was selling them as 'genuine' chips they severed their relations with him. This is not correct. When Major Riddle died and the Silver Bird closed, the Gaming Commission ruled that the estate could not sell the genuine rack chips to Borland. They said the chips had to be destroyed. Borland sued Gaming in federal court and won. The court ruled the chips were part of the estate. Borland bought them and these were the chips he was selling. The two stories have been mixed up over the years. Bud Jones did not make any chips for Borland. All fake coin inlays were made for Osborne. See the notes below the Silver Bird issue also. Coin inlay molds - it has been suggested that the counterfeit chips have square edges when compared to the slightly rounded edges of their genuine counterparts, and that furthermore, some counterfeit issues can be distinguished by the fact their molds are smooth whereas the originals are incused, and that these differences arose due to changes in production technique. Although there is a pattern identified with these chips, I do not fully subscribe to these theories. The rounding of edges is something that is done at the finishing stage and has nothing to do with the molds in use or chip production. Both genuine chips and counterfeits of same could exist with both square and rounded edges. Furthermore, whilst it is accepted that the fakes all have smooth molds, not all smooth molds are fakes (note in particular the Castaways). However, it should be pointed out that there was a change in the production process, which led to spun (those that appear to have concentric circles) inlays changing to a smooth type, and the material for the mold changing to a much harder, more brittle plastic. These changes help to identify certain issues, but not all, as being counterfeit with absolute certainity. 'Not all', because, while the changeover seems to occur at the time BJ moved from predominately incuse to non-incuse coins, both molds and types were in use at the same time for a period. Refer also to my article on the Nevada and Diecard molds. High denominations - it has been suggested that a number of the chips of $100 and above must all be fake as the casinos they were issued on were so small they would never have either used them or had the means to cash them in. This theory is not totally correct either. It may be true for a single table casino, but anywhere larger will need chips of $100 or above to avoid being 'run ragged' by even mediocre stakes gamblers. Dating - some of the counterfeit chips are thought to have been 'in circulation' at the same time as the genuine ones. 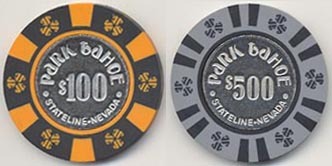 Park and Sahara Tahoe chips are also said to have been from cancelled orders and sold by BJ to Borland. Again this is not true. The only chips that ended up in Borland's store came from Osborne. Bud Jones would never have counterfeited any chips for open casinos else the company would never have survived. In the wake of the Gaming Commission investigation over the Foxy's Firehouse chips (see below), Bernard 'Bud' Jones' widow shredded all the records so that there could be no trace of the other chips made for Osborne. It is however fair to say that in the case of the coin inlays at least, either there was always a genuine counterpart for the inlay, or an order had most probably been placed at some time even if not fulfilled. It is doubtful that Bud Jones would have had additional dies made to stamp the inlays. Although Carl stated, and we know for some denominations it is true, that a case (understood to be 2000 chips) was made for each chip, that would amount to some 54,000 chips. At 1989 prices that would have cost in the region of $35,000, and it is doubtful whether Carl could have raised those funds alone. Some of these chips turn up more frequently than others, and like the Borland commemoratives and counterfeits, may have been produced in more than one 'run'. As far as I can say, the chip shown above is a counterfeit. All of the examples I have seen are uncirculated with sharp edges, unlike the other coin inlay denominations from this casino. 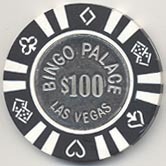 It is unknown whether a genuine $100 existed, the casino had plenty of other chips from that denomination, and as the other genuine coin inlays were only delivered shortly before the casino closed, it is quite possible that the die was made but the genuine chips were not. The $100 with darker inserts is a genuine chip. This particular example is in fact well used. The inlay is 'spun' (has concentric circles) and the mold has the harder, lucite type appearance of BJ's early coin inlays. The other $100 is the counterfeit of that chip. There is a noticeable difference in the colors, type and feel of all the denominations. In my opinion the genuine chips are all scarce. The counterfeits are shown on the top row with their genuine counterparts underneath. All counterfeits are non incuse. All genuine chips are incuse, and of the same characteristics (spun, lucite type) as the Castaways described above. The colors of the counterfeits are a good match to the originals. The chips pictured above are counterfeits. Please see the notes for the Bingo Palace above. Again, all the examples I have seen of these chips have the same characteristics as the other counterfeits. It is, however, unlikely the casino could have functioned without a denomination above $25 and no other chips have been recorded. 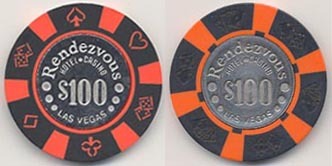 Both examples of this single denomination of the Rendezvous display the same characteristics as the Holiday International chips listed above. ** - See note at the bottom of the coin inlay section. Again, all the same characteristics are displayed for both the counterfeit and genuine chips. 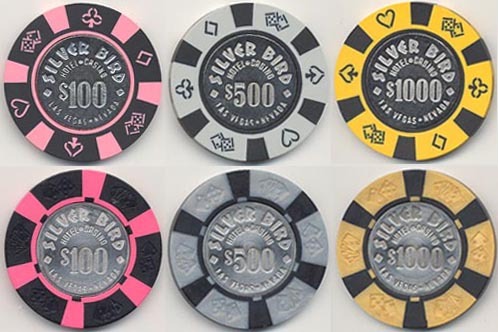 Both the counterfeit and genuine Silver Bird chips follow the exact pattern as described for the Holiday International chips above. N2195 was the ONLY $100 chip that was ordered and made for the casino. This is the chip that the owner Major Riddle gave to VIP's and High Rollers in belt buckles, key chains and bolo ties. Some examples are thus known with shaved edges. The color matches are not as close as for other counterfeits. 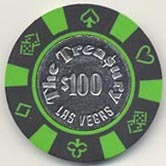 In my opinion, The Treasury may never have had a genuine $100 chip. As with the Bingo Palace, the die had probably been cast but with no chips delivered. The casino closed in 1982, pre-dating Bud Jones introduction of the smooth molds. The other coin inlay denominations from the casino are incuse. No incuse $100 has ever been recorded. 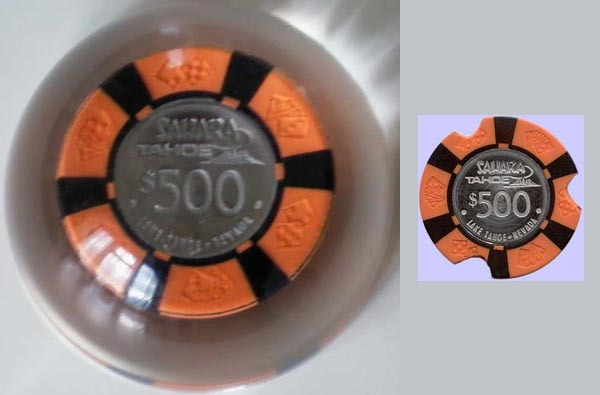 ** - Note - The genuine Sahara Tahoe $500 was only known released in a lucite paperweight, given to high rollers. The notched example is probably unique. The paperweight is shown full size, the domed lucite magnifies the chip inside. Note on the H&C molds. The first H&C mold was made for Christy and Jones, and all 'shiny hat' CJ chips were manufactured for them by Burt Co. When CJ dissolved and Paul-Son formed in 1965, Burt continued to manufacture chips for PS until the early 1970's. At some point thereafter, the mold was returned to Paul-Son. It is not known for certain whether it was defaced or worn out when returned, but some subsequently produced PS chips below were either made using that mold or another identical. Chips from the mold differ from some other PS made 'long cane' H&C's (LCV) in that they have a much wider 'outer ring'. I refer to the original mold possibly used later by Paul-Son, where applicable, as the "ex Burt Co./CJ mold". Other PS chips referred to below were made on the 'short cane' (SCV) mold. All Eddie's $100's and $500's in the design above are believed to be counterfeits. The inlay design would have already existed from the genuine lower denominations. A genuine $100 is thought to have been made with a different shape inlay, although no survivors are recorded. The left hand example of the $25 is the counterfeit. It does vary slightly in color to the genuine chip. It also differs by virtue of the fact it is a Paul-Son mold (SCV) chip (like all the counterfeits) whereas the genuine one is LCV, possibly made from the ex Burt Co./CJ mold. All the counterfeits appear to have some sort of laquer finish on them and all the examples I have seen are the same. I have never seen any differing examples of the $100 and $500 nor any with the slightest sign of wear. In my opinion, a genuine $100 would have existed, most probably another LCV. 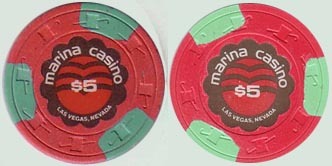 However, I believe all Marina $500 chips on the SCV mold to be counterfeits. See also note *** at the end of the Hat & Cane section. The counterfeit $5 was made with a hub shape inlay. Maybe this was an error on the counterfeiters behalf as the genuine $5 CJ chips all have cog inlays. Their were two distinct orders for the genuine $5, the first being in dark red and the later re-order in maroon. The print on the first order is fractionally finer. The counterfeit is a close color match for the genuine maroon, however the insert colors are noticeably different. All genuine Mint $5 and $25 H&C's are CJ's manufactured by Burt Co. The genuine $25 chip is very scarce, only two notched examples are recorded. No un-notched chips are known although Blanchard confirms the Burt Co. records show the order was fulfilled for CJ. The $100 and $500 shown with LCV are counterfeit. 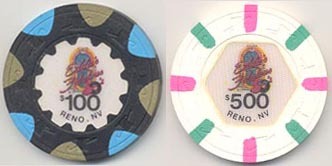 The only recorded genuine $100 and $500 (SCV) chips are also shown. *** - Note - Although I have as yet no firm evidence other than what I have deduced so far in my research, I am suspicious that counterfeits were also made of the Marina $5 value. The scan below shows the well known genuine chip on the left, being a Paul-Son LCV, possibly produced on the ex Burt Co./CJ mold. On the right is a Paul-Son SCV. Apart from the fact this hat & cane variance mirrors other Osborne counterfeits, there is a distinct difference in both the color of the chip and inserts. Furthermore, all the LCV examples I have seen are well used, whereas all the SCV's are uncirculated. I accept that these could have been delivered to the casino just before they closed and hence remain unused - however, if that was the case, they would have been printed 'HOTEL' rather than 'CASINO'. The $25 Marina was itself only recently confirmed for certain even though Osborne had admitted it. In my opinion this $5 was counterfeited at the same time. The SCV's of both these values were only reported many years after the casino closed. The chips shown below were manufactured after the casino closed. They bear the same characteristics as the Osborne H&C counterfeits. A large number of the chips have the same laquer finish referred to under the Marina's. 12 different colors exist, all made in small quantities. Carl Osborne may have been involved in their production.